Kratos’ first adventure debuted in 2005 on the PlayStation 2. Since then the formula didn’t really change, with the hulking brute killing his way through mortals and gods in his selfish quest for revenge. Attempting to showcase such an established and iconic character in a different light would be incredibly challenging but somehow Santa Monica succeeds in God of War. Serving as a reboot and sequel God of War doesn’t signal the end of the franchise but a brand new beginning. God of War takes place years after the events of the third game. Kratos has left Greece for the world of the Norseman known as Midgard. The veteran god started a new family and is trying to leave his previous life behind. 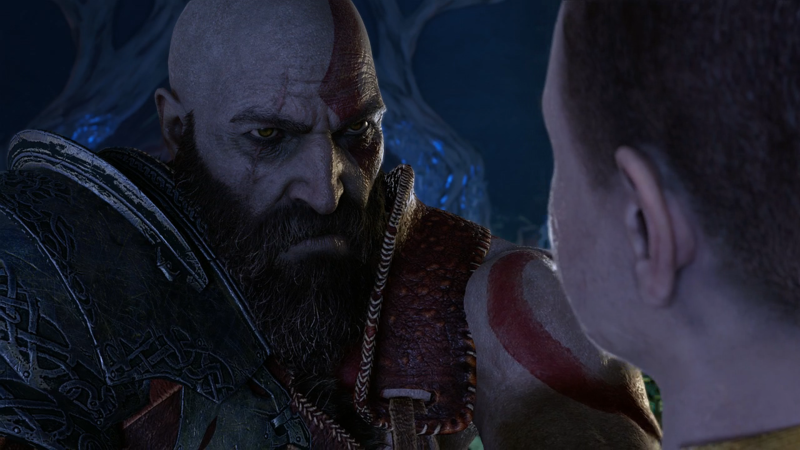 His wife has passed away and left Kratos to raise their son Atreus, but now without one final request. Scatter her ashes on the highest peak in the land. The story sounds simple but like the world is elaborate and full of details. 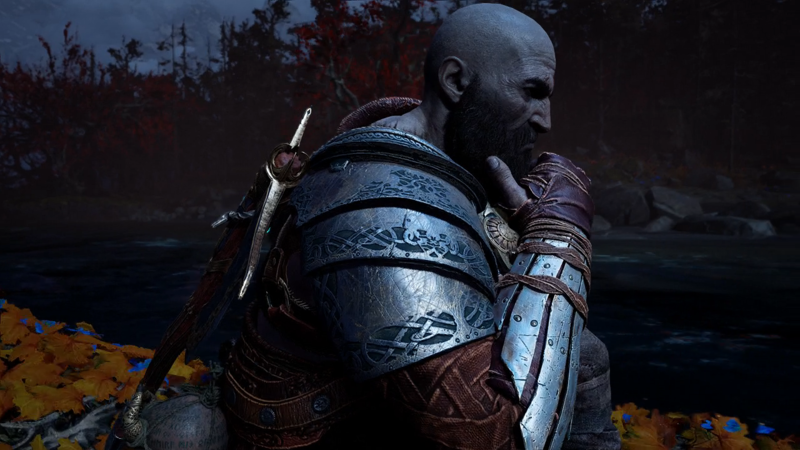 Kratos constantly reminds Atreus of their goal, reaffirming that everything that is transpiring is because of this final request. God of War world is open and full of mysterious to uncover. 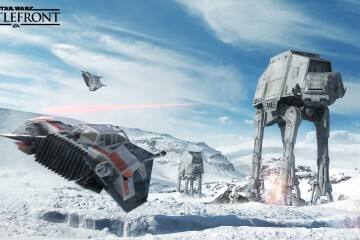 While it’s not a true open-world it features enough optional content to encourage exploration. Many are gated with powerful enemies that can take Kratos down in one hit or locks requiring specific story-related items. 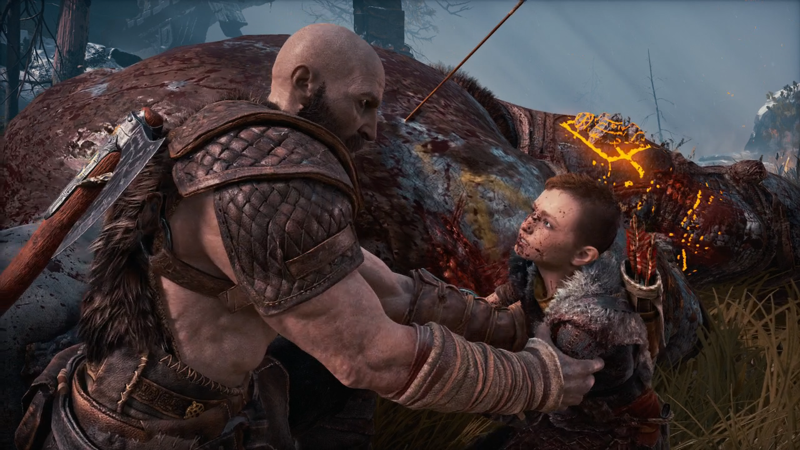 Seeing Kratos attempt to teach and nurture Atreus is unnerving at the start, especially for those who are aware of Kratos’ track record with children. However, the bloodthirsty hulk turned father attempts to bury his savage instincts and you can see it as Kratos takes breaths and attempt to surpass his anger. Natural writing, fitting voice actors, and flawless animation provide a well-paced story that doesn’t disappoint. 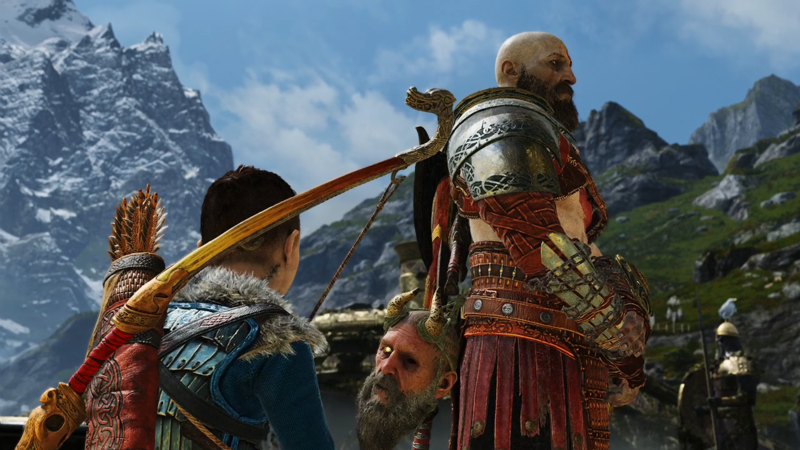 Atreus serves as Kratos’ second chance. Raised in isolation the only knowledge he has of the outside world comes the stories told to him by his mother and attempts to find his place in it. Like Kratos, Atreus feels like a stranger as he sees the world for the first time. Both Atreus and Kratos fight alongside as the duo team up against the hordes of enemies that stand in their path. The new over-the-shoulder camera brings you directly into the battlefield but limits your view. 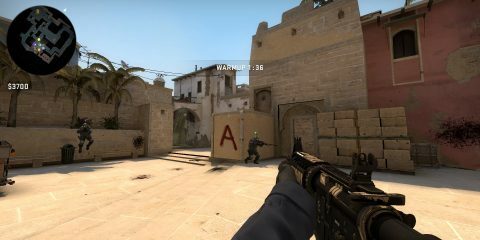 You cannot see what’s behind you but indicators provide some awareness by alerting you of enemy locations and whether they’re about to launch a range or melee attack. Atreus is indispensable in combat, serving as a skilled archer he can launch a barrage of arrows. While you don’t have direct control of Atreus, the ally AI does a servable job of maintaining itself and since Atreus cannot be killed you don’t have to worry about him. Atreus also has access to specialized arrows and abilities which can be used for added damage or distractions. What’s surprising is that without Atreus I felt at a disadvantage, seeing him as an extension of Kratos during fights. This is not to say Kratos isn’t more than enough to handle the enemies of Midgard. Dawning the Levithan ax Kratos can perform your standard heavy and light attacks, combining them with Atreus’ marksmanship shots, but can hurl it and call it back like Thor’s hammer. You’ll gain access to special tactics that allow for unique attacks such as an ice-infused shockwave and health regeneration. Each one requires a cooldown, preventing players from spamming them and provide variety to the combo system. Enemy variety is healthy and diverse. Preventing players from spamming combos some enemies come with unique weaknesses that must be taken advantage of before damage can be inflicted. This includes stunning them using Atreus’ arrows or using Kratos’ shield to knock them down. If enough damage is done players can perform a specialized takedown that highlights Kratos’ strength and brutality. Enemy animation is an exception with distinct movements for each attack to telegraph their tactics, but to help players Santa Monica also included a color-coated tell that displays if an attack can be parried or unblockable. The boss battles are absolutely amazing. 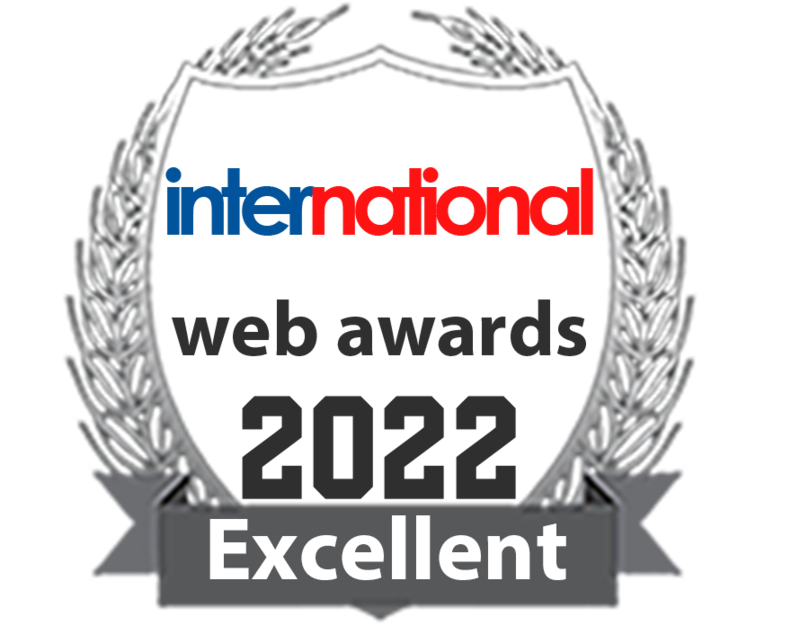 Each one is distinguished and complemented with outstanding cinematics to highlight their power and place in this world. It’s hard to get into details without spoilers but even the most minor boss battles have a purpose to this overall adventure. New layers are constantly being introduced to the combat system during the course of the adventure. However, the lock-on system can be vexing. The game automatically locks onto the closest enemy but in a room with 6 or more, this can cause the system to become confused as it attempts to keep 1 enemy in view. In addition, manually locking to an enemy is frustrating as the target icon will disappear if the enemy gets too far or goes behind Kratos. Since Kratos cannot defend or attack from behind you have to either use the 180 turn to switch directions or attempt to get everyone in front again. The customizable has been retooled from past games. Instead of a straightforward leveling system with hidden items to boost Kratos’ health and magic players collect special resources to upgrade their armor for both Atreus and Kratos. Each type of upgrade has their own properties that benefit a specific statistics and even provide unique abilities such as Atreus having access to a healing spell during combat. This can become overwhelming and doesn’t really serve a purpose until the end of the game or in the hardest mode, Give Me God of War. Experience is given for everything, from completing battles to finishing quests. It’s simple enough, with moves and abilities getting unlocked as you upgrade your weapons and armor to access more of the trees. It’s a shame that no New Game Plus exist seeing that obtaining the most powerful items requires a lot of effort, but never a grind. By the end of the game, I’d obtained enough resources to craft some of the powerful items and still had ample end-game content to play. In many ways, God of War serves as a fresh start but continues the tale started in 2005. It plays differently, has a new setting, and places new threats to face but it’s still God of War. It honors the past while acknowledging certain things can be improved on and does so with exceptional quality. Kratos is no longer the one-dimensional warrior but now walks a new path. After playing God of War it’ll be hard to see the franchise as it once was ever again.